WASHINGTON, DC, February 12, 2014 (ENS) – The Obama administration Tuesday announced a new National Strategy for Combating Wildlife Trafficking that marshals the resources of all executive branch agencies. As part of the new strategy, the U.S. 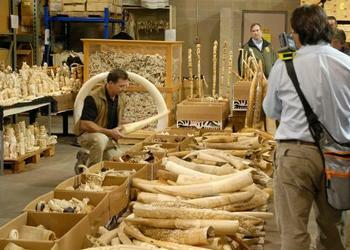 Fish and Wildlife Service will implement a U.S. ban on commercial import and export of elephant ivory. This unprecedented action comes in response to the escalating activities of wildlife criminals that threaten the survival of the African elephant, rhinoceros and many other species around the world, said federal government officials. The Obama administration’s announcement is timed to coincide with the London Conference on the Illegal Wildlife Trade, convened by the British Government, taking place this week in London. In November, federal government officials crushed six tons of confiscated ivory in an event in Denver, Colorado designed to undermine the black market value of poached ivory. With revenues totaling many billions of dollars, wildlife trafficking is estimated to be fourth largest transnational crime in the world. It is estimated that poachers, working with criminal syndicates, killed as many as 35,000 elephants in 2012. In 2013, data shows that nearly 100 elephants were killed every day. 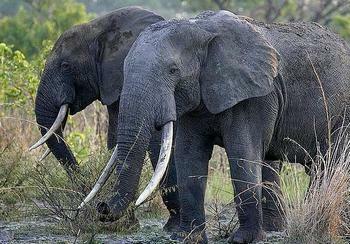 Globally, the illegal ivory trade activity has more than doubled since 2007. The ban will impose new restrictions on the import, export, and commercial sale of elephant ivory within the United States, with some exceptions. The exceptions include a narrow class of antiques that are exempt from regulation under the Endangered Species Act, and items imported for commercial purposes before 1990 when international commercial trade in these species was prohibited under the Convention on International Trade in Endangered Species. Anyone proposing to sell elephant ivory or rhino horn would be responsible for documenting that these ivory or horn pieces are exempt. The Service expects this to be a small fraction of the current domestic trade. Anyone who currently owns legally obtained ivory may keep it. • Prohibit Commercial Import of African Elephant Ivory: All commercial imports of African elephant ivory, including antiques, will be prohibited. • Prohibit Commercial Export of Elephant Ivory: All commercial exports will be prohibited, except for bona fide antiques, certain noncommercial items, and in exceptional circumstances permitted under the Endangered Species Act. • Restrict Domestic Resale of Elephant Ivory: We will finalize a proposed rule that will reaffirm and clarify that sales across state lines are prohibited, except for bona fide antiques, and will prohibit sales within a state unless the seller can demonstrate an item was lawfully imported prior to 1990 for African elephants and 1975 for Asian elephants, or under an exemption document. • Clarify the Definition of Antique: To qualify as an antique, an item must be more than 100 years old and meet other requirements under the Endangered Species Act. The onus will now fall on the importer, exporter, or seller to demonstrate that an item meets these criteria. • Restore Endangered Species Act Protection for African Elephants: A previous Fish and Wildlife Service special rule that had relaxed Endangered Species Act restrictions on African elephant ivory trade will be revoked. • Limit Sport-hunting of African Elephants: The Service will limit the number of African elephant sport-hunted trophies that an individual can import to two per hunter per year. The ban comes after more than 111 partner groups and more than 100,000 people sent letters to the administration asking for a moratoria on ivory sales through the public awareness campaign, 96 Elephants. The Richardson Center for Global Engagement today applauded the Obama administration’s new strategy to strengthen and leverage federal resources to combat illegal wildlife poaching and trafficking. Humane Society of the United States President and CEO Wayne Pacelle says that while the ban on U.S. ivory trading is a step in the right direction, it does not go far enough.